Over a century after it first hit the highway, Porsche has finally unveiled the first car its founder ever designed. And guess what? It's electric. When you think of Porsches, you undoubtedly imagine smooth lines, purring engines, and blistering speeds. The Egger-Lohner electric vehicle, C.2 Phaeton model (a.k.a. the P1), designed by Ferdinand Porsche, has none of those things. In fact, it's a little more than an old-timey wagon with a gas-hybrid electric motor attached to the back wheels. The P1 was a big deal at the time, though. 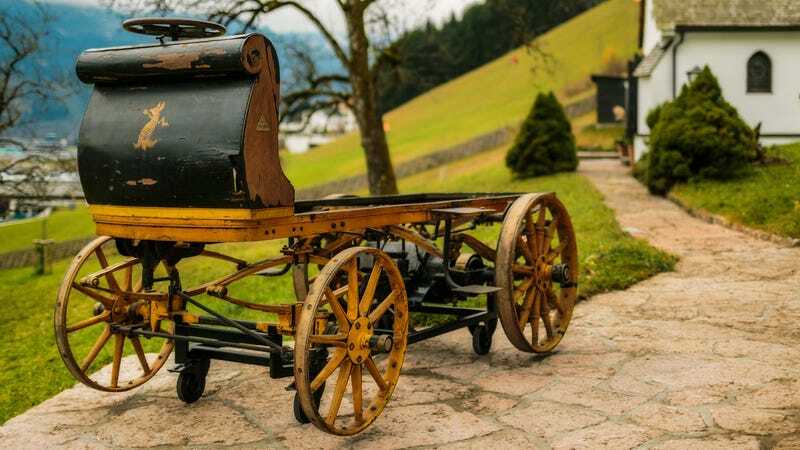 Then 23, Ferdinand Porsche equipped the vehicle with a unique three horsepower engine with an "overloading" mode that gave it an additional two horsepower. That enabled the 2,977-pound P1 to hit a top speed of 22 miles-per-hour and travel a distance of about 50 miles before it needed refueling or recharging. It even managed to finish a 40 kilometer EV race in 1899. It won't be hitting the racetrack again any time soon, though. After being discovered in a warehouse in Austria, this P1—one of only four ever manufactured—is headed to the Porsche Museum in Stuttgart where it will be displayed alongside the company's latest face-melting race car, the 918 Spyder. Makes you wonder just how much the cars will change in the next century.